← Great News – Phase 2 is GO ! St John’s Sunshine has all its solar panels in place and couldn’t have done it without help from a lot of folk. The 2nd Phase saw over £10,000 raised but the last three years have involved much more. Whether you contributed time, money, a photograph, a poster, shoulder to cry on, expertise, solar kit, food, an auction contribution, attendance at an AGM or simply cheered us on (or were the friend of someone who did! ), we want you to come on over to help celebrate this great achievement. 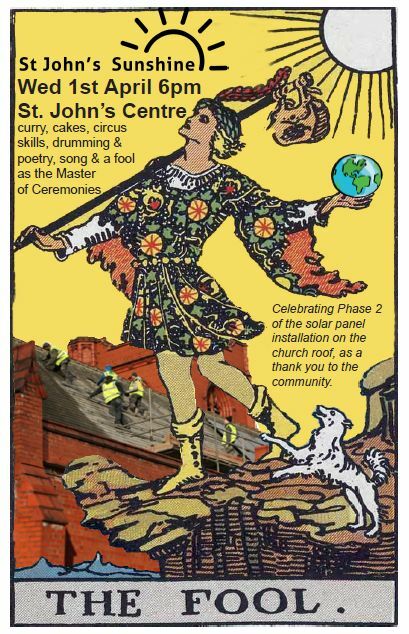 Curry, cakes, circus skills, drumming & poetry, song and a fool as the Master of Ceremonies. St John’s Sunshine is not a religious organization, but brings together people with a common concern for community and creation. In 2012 April 1st fell on Palm Sunday and we launched the share offer after a church service. This year April 1st falls in Holy Week, when Christians are asked to consider the ‘foolishness’ of Christ. Before our community celebration we are inviting people to a short meditative service in church at 5pm, reflecting on how foolishness in a worldly sense can be unexpectedly fruitful for community and creation. The liturgy is entitled ‘The Holy Fool and Wounded World.’ Whether you believe, or not, you are welcome to attend. The service lasts less than an hour.